Instruction Section Website | The Instruction Section is part of ACRL, a division of ALA. The 2019 Instruction Section has chosen two recipients for a Special Certificate of Recognition and Appreciation. Brad Sietz, LOEX Director for the LOEX Conference and LOEX Quarterly, has received one of those certificates. LOEX is a self-supporting, non-profit educational clearinghouse for library instruction and information literacy information. Brad’s work on LOEX for over a decade has made it the premier information literacy conference for librarians, nationally and its reputation is growing internationally. Tell us about LOEX and your involvement in it over the years. LOEX was started in 1971 at Eastern Michigan University (EMU) in Ypsilanti, MI. Its official name used to be the LOEX Clearinghouse for Library Instruction (now it is just LOEX) and that’s a pretty good jumping off point to describe its original purpose—a place where librarians could find & exchange both library instruction resources (physical materials, such as mimeographs and video tapes, in those pre-internet days) and ideas (through an annual conference and a Quarterly newsletter). LOEX has member institutions (currently about 675) who pay a small annual fee to get discounted registration fees to the conference along with a subscription to the Quarterly and a Currents e-awareness newsletter. Over the years, LOEX has stayed true to that purpose while broadening it—the conference used to just be held in Ypsilanti, but for the past 25 years it has moved all around the country; we also now offer a selection of online breakout sessions after the conference. The Quarterly has evolved from a newsletter to a journal focused on short, practical articles. Physical materials are no longer exchanged, so LOEX now has a website where online materials can be accessed. I started at LOEX in 2006, right after getting my MSI at the University of Michigan’s School of Information. I am the LOEX Director, the sole employee of the organization and I spend my time managing the membership, editing & producing the Quarterly and Currents, and planning & coordinating the annual conference. LOEX also is now separate from EMU, becoming an independent 501(c)(3) non-profit five years ago, though we are still based in Ypsilanti. The LOEX annual conference is well-attended and even revered by academic librarians. What do think accounts for its sustained success? Yes, I was very fortunate to come into a situation with a well-attended, well-liked conference already in place, so my main job was (and still is) to not screw it up and build upon its long-history of success. I believe what accounts for this success is it has a clear focus (library instruction for academic librarians) while still having breadth (a wide variety within that focus–not just assessment, online learning, etc). If you’re a librarian who does instruction and cares about information literacy, you can get a great feel for what is going on across North America (and a few other parts of the world) by spending just a couple of days at LOEX. Additionally, the culture of the conference is a big plus. We work really hard to make it a welcoming, collegial event that is not only packed with great sessions, but plenty of opportunities to talk to fellow librarians in more relaxed, yet often structured settings (e.g., numerous dine-arounds on Friday night) on a personal and professional level. What was a really notable moment in LOEX’s history? LOEX has been in existence for almost 50 years and, for most of that, it was wholly a part of EMU. Then, about five years ago, EMU went through some organization planning changes and we all decided that LOEX needed to become an independent entity. This was both exciting and scary, as it would allow more independence for LOEX, but we would also need to take over all administrative functions and there would be no backstop if something unexpectedly bad happened, especially monetarily. But this change gave LOEX the opportunity to really examine its mission, and create more opportunities for people to contribute to the direction and work of the organization—for example, now LOEX has a Board (previously it just had an Advisory Council) that drafted bylaws and oversees the entire organization. While it hasn’t always been fun learning how to properly follow all the rules & regulations of federal & state non-profit agencies, make a payroll, setup a retirement plan, etc, it has given us a great deal of freedom—if we think something is a good idea and will work for LOEX and its members, there is no need to run it by a much, much larger organization or have to go through a more complicated financial approval system. It has been very gratifying to realize LOEX can stand on its own, which gives us confidence LOEX—with smart planning, hard work and a little luck—will be around for another 50 years, whether LOEX decides it is best to stay completely independent or partner with a larger institution. What are you most proud of about your work with LOEX? To pick just one: LOEX’s role in developing and providing opportunities both for new librarians and for librarians that have recently transitioned into an instruction-focused role at their institution. For those who make LOEX the first national conference they attend or where they conduct a national presentation (either as a student poster presenter or as a breakout session presenter), because their institutions often are members, it makes it easy to notice those folks as they advance in their careers, and I am glad LOEX played a small part in that. In addition, my conversations with department heads and my review of conference evaluations makes it clear that library schools are, unfortunately, still not generally doing a great job in preparing new graduates for library instruction, so LOEX plays a vital role in helping develop those who need to get a broad-based “education” in library instruction and information literacy. Additionally, with the Quarterly (particularly the Book Reviews), I often work with many first-time authors (including occasionally students) and I take a lot of satisfaction in helping them through the writing and editing process. What do you want the library community to know about LOEX that you haven’t addressed already? That I’m the only employee of LOEX, so while I play a key role in its success, the drivers of that success are the volunteers—who serve on the Board, the Advisory Council, and the local committees for the conference—and the presenters and authors. LOEX is reliant on volunteers (e.g., each conference has a local committee of about eight people; each section of the Quarterly has an assistant editor) to make LOEX “work”, and I am very appreciative of their contributions. It really is a community-driven enterprise and there are plenty of opportunities for folks to contribute and grow, no matter what stage they are at in the career. Please join the IS Membership Committee for post-ACRL Virtual IS Membership Office Hours on Tuesday, April 23 at 12:30-1:30 pm CST, featuring IS Executive Committee member & ACRL presenter, Veronica Arellano Douglas – as well as other conference attendees who are members of IS – to catch up on some major themes and takeaways, lessons learned, and more. Note: Please do not access the meeting link above prior to 15 minutes before the start time, as you may interrupt another meeting. If you have any questions, please feel free to contact IS Membership Committee Chair Marjorie Lear at marjorielear@gmail.com. We look forward to connecting with you! What’s your favorite “thinking” beverage? An activity that I like to do at the beginning of many classes involves asking students to think about a research project they have done in the past and identify one successful strategy they used and one challenge they encountered. I use a think/pair/share approach for this activity, asking students to first do some individual freewriting then share with a small group. Then, I go around and ask each group to share one challenge and one strategy they discussed with the whole class. I write these on the board and sometimes elaborate on why certain things are challenging or make connections between challenges and strategies that groups have mentioned. I move from this activity into a slide about goals for the session and try to illuminate how the goals will address specific challenges that have been mentioned. I like this activity because it uses the students’ experiences as a starting point for the class. It allows students a chance to recognize and share what they already know and also makes clear that it’s OK to experience some confusion and frustration when it comes to research. Throughout the class I try to look for moments to refer back to the students’ ideas and experiences, highlighting how specific skills or practices can provide concrete ways to address a challenge. The class I teach the most is first-year composition. This is a required course at UD and all sections include a researched argument paper. The majority of instructors bring their classes in for a library session in conjunction with the research assignment. This leads to a high volume of classes, so I keep it fresh in two ways: one is by engaging with instructors to make sure the session is well-integrated into the course and the other is by engaging with students to delve into their research topics during class. When planning for a class, I ask instructors about the smaller assignments or in-class activities they have done related to the research project. I try to develop activities that build directly on the work students have already done so that they immediately see the relevance of the library session and are motivated to participate. During the class I build in time for students to work individually or in small groups and I go around and hear about their research process, ask questions, and offer advice. These one-on-one conversations with students remind me that the content of the session and the experience of doing college-level research is always new to the students and motivate me to be enthusiastic and engaged in every class I teach. 1) Don’t be afraid to think creatively about what information literacy teaching can look like. It can be frustrating to encounter limited views of a librarian’s teaching role. One way that I’ve dealt with this is by seeking ongoing opportunities to do research about pedagogy and information literacy theory. This experience has made me more knowledgeable but also more confident, allowing me to bring new approaches into my teaching. 2) Build connections and partnerships, formally and informally. In my experience, many universities talk about how they have a “silo” problem, where departments and units across campus don’t communicate with each other. That can make it challenging to connect with colleagues outside of the library, but not impossible! When you’re new to an institution, find ways to get outside the library and meet colleagues from offices that provide student support (such as tutoring centers or residence life) as well as from academic departments. Look for events like brown-bag discussions, training programs such as Safe Zone, committees, or informal reading or writing groups. It’s interesting to hear about how other departments and professions within higher education talk about teaching and student success–and conversations like this can lead to exciting collaborative projects! The scholarship of teaching and learning (SoTL) is an area of inquiry ripe for librarian involvement that provides opportunities to engage with deeper questions around pedagogy and student learning. This online discussion will provide a brief overview of SoTL and discuss how library instruction program coordinators can use SoTL as a foundation for building and invigorating a culture of teaching and learning within their libraries. The presenters will discuss how instruction coordinators and directors can use SoTL as a way to foster creativity and engage librarians in exploration of their own teaching. We will discuss the challenges and benefits of moving from individual SOTL projects to a SOTL-infused teaching and learning culture, and what can enable this transformation. We will offer strategies to support library leaders in making connections between SoTL projects and promoting pedagogical innovation within a library instruction program. Project Description: This tutorial is intended for novice researchers who need to search a library database. It walks students through the keyword selection process, teaching them how to choose keywords related to their research question, and brainstorm related terms to search. The tutorial includes written instruction, videos, and hands-on practice. It incorporates assessment through a flashcard sorting activity and uses embedded forms to capture student responses on an activity asking for their research questions and potential keywords. Nicole Pagowsky and the organizing committee comprised of Scott Buchanan, Jessica Calderwood, Jen Nichols, Anthony Sanchez, Maribeth Slebodnik, and Niamh Wallace, received the Special Certificate of Recognition and Appreciation for creating the Critical Librarianship and Pedagogy Symposium (CLAPS) held at the University of Arizona.The Symposium builds community among librarians interested in recognizing and critiquing power structures inherent in information practices, and in library professionals’ work as educators. The 2018/2019 Awards Committee conducted the following interview with Nicole and the other members of the CLAPS organizing committee. What was the impetus for starting the Critical Librarianship and Pedagogy Symposium? As we have been implementing our campus-wide instruction program at the University of Arizona Libraries, with Nicole as Instruction Coordinator and most on the committee in the same department, we were actively incorporating critical pedagogy into our library instruction mission/philosophy and learning outcomes adapted from the ACRL Framework. As we discussed this, and how to provide more learning opportunities for staff, these thoughts combined into an idea that we could potentially bring a conference here and have it focus specifically on critical approaches to library instruction. Over the last few years, conversations have reached a peak surrounding critical librarianship and critical pedagogy, and so interest has been high in learning about and engaging in these topics. Many attendees speak very highly of their experiences at the Symposium. What do you think it is about the Symposium that makes people so appreciative? We all (the committee) have had many experiences with conferences, good and bad, and so we were all excited about the opportunity to make this conference everything we would desire. We wanted it to have enough structure to alleviate stress and have focus, but also to be loose so people feel comfortable engaging and participating. One hope is the conference encourages creative and experimental ways to talk about these topics and attendees feel they have the right type of platform to test out their ideas and engage with peers. We also wanted to make sure the conference was fun! Not through kitsch, but just providing many opportunities for both socializing and quiet reflection. What are you most proud of about the Critical Librarianship and Pedagogy Symposium? Not to sound cocky, but it’s hard to choose just one! Mostly how successful we’ve been with promoting inclusivity. No event can be perfect, and we always want to get feedback and improve, but from what we have surveyed from attendees, this is an area of success for us. Another area would be how wonderful all the attendees who chose to come to CLAPS are; the keynotes, presenter sessions, and informal socializing has been consistently fantastic both years and our committee always looks forward to welcoming everyone to Tucson. What is next for the Symposium? We are so excited that library admin has approved ongoing funding for CLAPS to take place every other year, starting now with March 2020 (exact dates to be determined). As this is being written, we have our first 2020 planning meeting tomorrow so that we can start thinking about who to invite to keynote (please email Nicole if you have suggestions! nfp@email.arizona.edu), figure out what dates we can go with, and start narrowing down a campus location. We have enough funding to still make the event free, and are trying to find more creative ways to expand attendee capacity. We have had to cap it at 120 people both years based on the size of the rooms we were able to secure within our budget, as well as how much food we can provide based on our budget. It would be great to expand since we keep having an overflowing waitlist, and we are going to see if it’s possible. What do you want the library community to know about the Symposium that you haven’t addressed already? Just that we are so honored to receive this award and are heartened that so many people appreciate the work we have put into CLAPS. In addition, CLAPS wouldn’t be what it is without the interest and participation of so many wonderful people, and so we want to thank those who have attended and support CLAPS over these past few years for our 2016 and 2018 conferences, and hopefully into the future. You’re invited to attend the ACRL Instruction Section Awards Ceremony on Thursday, April 11, 1-2pm, in the Hilton Hope D. A $50 Amazon gift card will be available as a door prize while we gather together to celebrate the achievements of our colleagues. Chris Ervin (Undergrad Research & Writing Studio Coordinator), Jane Nichols (Head, Teaching & Engagement Librarians), Beth Filar Williams (Library Experience & Access Department Head), Hannah Gascho Rempel (College of Agricultural Sciences Librarian & Graduate Student Services Coordinator), Dennis Bennett (Writing Center Director), and Uta Hussong-Christian (Science Librarian), Oregon State University, for their Undergrad Research & Writing Studio (http://writingcenter.oregonstate.edu/undergrad-writing-studio). The Studio is a collaboration between OSU Libraries and the Writing Center delivering peer-to-peer point of need hands-on and experiential learning. 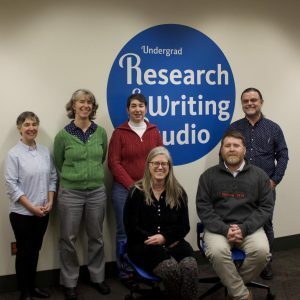 The 2018/2019 Awards Committee conducted the following interview with Chris Ervin, Jane Nichols, and Beth Filar Williams of the Undergrad Research & Writing Studio team. What was the impetus for creating the Undergrad Research & Writing Studio? The Writing Center was outgrowing its space and discussions began about co-locating in The Valley Library. This pressure for the Writing Center to move created an opportunity for us to rethink our service philosophy. We were aware of writing centers moving into libraries as a trend, but at the same time one of our colleagues was working with another university on the concept of studio pedagogy. In this model, students don’t have appointments, instead, consultants move from student to student in a point of need model. This mirrors libraries’ point of need service philosophy. The library wanted to be on board with the project because of the pedagogy model and because we strive not to just have “tenants” in the building but rather partnerships in offering services. Why did your team think this model would be the most effective in solving the problem? The studio pedagogy model was considered most effective because it mirrors libraries’ point of need service philosophy. Using Service Design Thinking was considered an effective way for the implementation team to work in a short time frame, 9 months from deciding to move to the first day of service. This framework helped us see how our service philosophy would work in practice. The implementation team was comprised of Writing Center and library folks (librarians and library staff) who designed the Studio in a way that would best meet the needs of students. We were methodical about how we were going to create the Studio, using the service design method [Library Service Design: A LITA Guide to Holistic Assessment, Insight, and Improvementby Joe Marquez and Annie Downey]. With the Studio, we could establish more cohesive partnerships and deliver more cohesive services thinking about student needs. We did journey mapping (the daily journey of a student) to determine the best flow in making the Studio effective for student seeking help. Now that you’ve moved out of the pilot stage, how will you sustain the Undergrad Research & Writing Studio? Marketing is important. Our baseline numbers are about 70% higher than before the Studio. An individual consultation in the Studio covers both research and writing help, and we want students to know that. The space has a large footprint. We have the space to host multiple small-to-medium sized classes at the same time, not just a tour, but writing and research activities, using the research and writing consultants. Part of marketing includes reaching out to STEM and other disciplines, like the Department of Communications, who don’t use the Studio as much as other disciplines. We’ve found that international students love the Studio, and we don’t have to market to them very heavily as they already love us. Another aspect of sustainability is training for consultants. We have a Research Based Writing Professional Development Seminar, which is 8 weeks, 50 minutes per week, and the Student Consultants are paid. On the staff side, we meet regularly, keeping the lines of communication open so that we all know what is happening. We rely on librarians to provide train-the-trainer trainings as well as co-training to keep the Writing Center/Library partnership tight. We’re also in the beginning stages of building out to other literacies outside writing and research. We want to create a stronger, more direct link with OSU’s Student Multimedia Studio, which is located in the library, so we can help students with projects like posters and videos. Did your results surprise you? How? As we mentioned, the Studio saw a 70% increase in student consultations compared to the old Undergraduate Writing Center. We expected an increase in usage with the location change. Previously the Writing Center was in a low traffic building; now it’s in the library, a high-traffic place. And students can come in and use the space even if they aren’t seeing consultants, just to study. But the 70% increase was a bit of a surprise. Underrepresented groups are heavy users of the Studio, but that wasn’t too surprising because the library is part of academic affairs and has strong partnerships with other offices that deal with those underrepresented groups. One thing we have had to work out is the role of librarians, which at the beginning wasn’t 100% clear. For some librarians, being a consultant is a good role. For others, the liaison role is a better fit where they encourage other people to use the Studio, or train Studio Consultants. We’re still iterating, we can still grow and change, the Studio is only in its second year. What has the response been to the Undergrad Research & Writing Studio (besides this award)? Generally positive. It has shifted people’s expectations about what a writing center can do. We ask for feedback from students who use the Studio. We ask consultants what they think through journey mapping, or space mapping. We have had to reframe student perceptions. For example, some students were initially confused by the space being occupied by a service instead of a study space. Some faculty are just beginning to learn about the Studio through Studio staff and librarians. For some, it’s a great match, but others aren’t ready. A few faculty are really excited and bring their classes over. For example, we have a Fisheries and Wildlife class that is working on a project through the Studio. We also have classes from the social sciences, so it isn’t just humanities and writing or English classes that are using the space. What advice would you give to other libraries who want to build a service or program like this? Use service design to help you plan. We brought the Library Service Designauthors, Marquez and Downey, in during the planning stages to do training. Hire outside people to come in during the development, a third party can help facilitate conversations. Be open to discovering something you might not have thought of. Make sure your implementation team has people from all partners. Bring people on board who value collaboration or want to collaborate with the library, who are not territorial. We saw opportunities for student learning which we wouldn’t have seen without those partnerships. One thing we regret is not having students on the implementation team. We consulted with them, but didn’t have them on the team. This was in part due to challenges with the implementation timeline, which spanned three academic quarters. But also we hadn’t allocated money to pay students. So make sure you include in your budget money to pay students to participate in planning. A Memorandum of Understanding (MOU) is very important; we created one for the pilot year and then renewed it for a three-year period. Refer to it, make it a living document, and add a revisiting piece to the MOU to ensure you go back to it. In fact, the next steps from our MOU include developing a shared goal statement and creating an assessment plan. 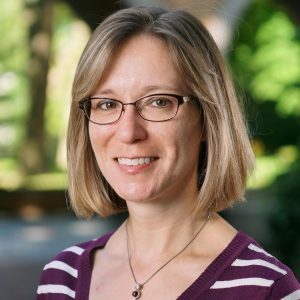 Stefanie R. Bluemle won the 2019 Ilene F. Rockman Award for her article “Post-Facts: Information Literacy and Authority after the 2016 Election,” published in 2018 by portal: Libraries & the Academy. The 2018/2019 Awards Committee conducted an interview with Stefanie after she received her award. What was the source of inspiration for this article? Like many people, I was stunned, though not entirely surprised, when Donald Trump won the presidency in 2016. It seemed to me that an entire worldview had been overturned and replaced by another. I don’t think I had ever thought so clearly about how many of our assumptions about democracy versus the kind of gaslighting authoritarianism that comes so instinctively to Trump have to do with our relationship to information. And it wasn’t just Trump himself, his campaign, or (now) his administration who played a role. As a candidate with a populist message, Trump could not have been clearer that he defined elites by their relationship to information; tapping into citizens’ existing ire against those elites is part of what helped him win. So of course, the election of President Trump had everything to do with information literacy and my own position as an academic librarian. It dawned on me: librarians find it so important to teach about authority and source evaluation, but what does any of that matter if a lot of people will instinctively dismiss certain sources of information quite simply becausethose sources claim expertise? And what do we really mean, anyway, when we talk about authority? I set out to answer those questions, and work through my own complicated response to our new reality in the process. Much has been published on the topic of fake news, critical thinking, and the role of library instruction in addressing the two. Your piece extends beyond fake news to consider the concept of post-facts and the role of emotion — that is, beyond objective fact-finding — in decision making. How do you think post-fact thinking will affect college students going forward? In certain important ways, college students (and all of us, librarians and other academics included) have always been affected by post-facts thinking. Librarians and others interested in epistemology have recognized for a long time that people have a tendency to look for and value information that confirms their pre-existing beliefs. What’s different now is that we have a presidential administration–and, increasingly, a major political party–that actively embodies and legitimizes the idea that you should prioritize what you feel to be true over evidence and claims to expertise. The Framework for Information Literacy for Higher Education talks about intellectual authority as being constructed in community. Thanks to Trumpism, post-facts thinking is an approach to intellectual authority that has been constructed and now legitimized in community. As academics, we have to recognize that the forms of intellectual authority we tend to recognize are up against post-facts thinking, which has just as much weight and legitimacy nationwide. We don’t know for sure where all of our students are coming from intellectually, and we probably shouldn’t assume we won’t encounter anyone who is fundamentally skeptical about traditional or mainstream forms of intellectual authority. What is the role of academic institutions, and academic libraries in particular, in the age of post-facts? It can be easy for academics to behave as though our undergraduate students are here to enter into our world–as though the value of learning about a discipline, entering a scholarly conversation, or revering peer-review will somehow be self-evident to them. I include academic librarians in that observation. It’s tempting to guide students toward being versions of ourselves, whether by teaching them the professional jargon and every nuance of navigating an academic library, or just by assuming they’ll care about the social, political, or other implications of information the same way we do. But when we stop and think about it, we know that students go to college for any number of reasons. For many of them, academic disciplines and practices are a different planet with little obvious connection to the lives they envision for themselves. Librarians who work with undergraduates are, by and large, very student-centered, a quality that has become even more important post-2016. We need to tease out the elements of our areas of expertise that can make the biggest difference to our students’ lives as they actually are, and we need to communicate with students about whythey’re doing what they’re doing. That’s abstract, and it’s a tough thing to do. I know I fail at least as often as I succeed. It’s a worthwhile goal, though. Additionally, post-facts politics effectively guarantees that libraries can never again even try to claim a form of neutrality. Some astute librarians have been arguing for a long time that libraries are never neutral. But Trumpism, just by being what it is, defines libraries, and especially academic ones, as political; that’s the world we now live in. So we have to acknowledge that–the inevitability, the inescapability, of standing for things that are political, whether we like it or not–even as we commit to making all of our students feel welcome. At the end of your article, you allude to ways in which academic instruction librarians might address source evaluation in the post-facts era. Do you have plans to follow up on the conversation you started in the article? What should we expect next from you? It’s always easier to identify a problem than a solution to that problem. By the time I wrapped up my main argument, I felt it would be a cop-out not to at least try to suggest remedies. That’s not to say that I think we can “solve” post-facts thinking or ever truly know how our students understand intellectual authority, either in college or later in life. But I do think there’s potential for librarians to move the needle, and I’m interested in gathering ideas for making that happen. So, yes, I do plan to follow up, although I’m presently still at the stage of reading and thinking and reading some more. It’s very much a work in progress. Similarly to the way I began this project by asking myself, “What is authority?” I’ve recently been wondering, “What, exactly, do educators at small colleges like mine mean when they talk about the ‘liberal arts’?” At some point I want to pursue this question as a way of thinking about where and how information literacy fits at a liberal arts college. Is IL ancillary to the liberal arts, or is it central, and what are the implications? I feel like something really important is just beyond my grasp, and I hope to figure out what that is.